Fort the love of MAD... - RKMBs v9.0: Rob's Damn Boards .:|:. Once every year or two I go through my MAD magazines and comics and enjoy the range of talent in their pages. An issue of MAD from any era is like a time capsule of whatever was dominant politically and culturally in the time it was published. And also amazing is how MAD, like no other part of the comics industry, kept the same assembly of talent for over 40 years of publication from roughly 1960-2000, and then some. Mort Drucker, Dave Berg, Antonio Prohias, Sergio Aragones, Al Jaffee, Frank Jacobs, George Woodbridge, Jack Rickard, Jack Davis, Paul Coker, Angelo Torres, Kelly Freas, Norman Mingo, and so many others. For all these creators to stay with MAD so long, it must have been a great place to work. MAD walked a fine line, with a sense of humor making somewhat serious commentary about the insanity of our world and culture. At various times my favorite has gone back and forth between talents like Prohias, Aragones, Drucker, Coker, Jaffee and the like. Even under the guise of humor, MAD was enlightening, giving a greater awareness of the adult world, and training the reader in their late adolescent years to take a cynical eye and sense of humor to the official message being fed to the public on any given issue. Growing up, it was a fun introduction to the more complicated political and cultural world outside of mainstream comics. Although I began reading comics in 1972, I began reading MAD within months of that. The first issue I specifically recall was the March 1973 issue, cover-featuring their parody of all 4 of the Planet of the Apes movies up to that point. "The Planet that went Ape"! My favorite line I can think of offhand was during "Conquest", where Caesar leads the apes against the human army to take over the world, and outgunned, he uses a secret strategy of laying out 10,000 banana peels to knock the human army off their feet to defeat them. Also good was the end of the "Beneath the Planet that went Ape" parody, where Taylor (Charleton Heston) is trying to stop the apes from blowing up the doomsday bomb, until Doctor Zaius says that if they survive they'll have to do another sequel, at which point Taylor grabs the self destruct and blows up the earth! I have scattered issues going back to 1955, and reprints of several of the original comic book MAD issues, including a Millennnium reprint of MAD number 1. And I have a complete run of MAD from 1969-1977, the era I enjoyed the most, with a lot of scattered issues and MAD SPECIAL issues after that. So... what are some of your favorite runs and features in MAD? You and I are about the same age so, pretty much the same run as you. It's such a great preservation of culture from the 1960's/1970's era. And while I'd kind of moved on by the 80's and 90's for the most part, what I sampled after remained very consistent. Even after William Gaines died in 1992, it was still consistent until the early 2000's! 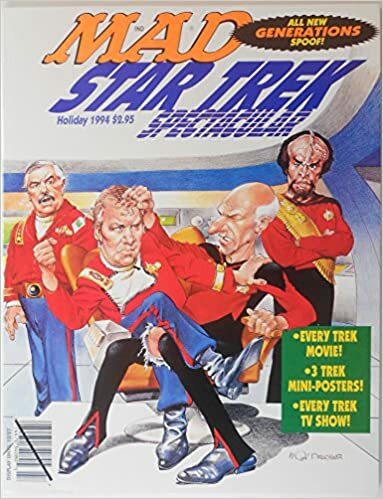 One I picked up in the later years was a MAD STAR TREK SPECTACULAR from 1994, that collected the TV series parody from MAD 115 (Dec 1967), along with a later musical version of the series by Drucker from 1976 (MAD 186, when syndicated re-run episodes were huge, but before the first 1979 movie), and movie parodies Star Trek:The Motion Picture (1979), Star Trek II (1982), III (1984), IV (1986), V (1989), and VI: The Undiscovered Country (1991), along with parodies of Next Generation, and Deep Space 9. 30 years of Trek culture! Mostly by Mort Drucker, with a little Coker Jr., and Don Martin. I recall from the 1967 parody, where Kirk and Spock beam down to the planet, and a Don Martin-looking alien walks up, "Hi I'm Flob, keeper of Goodbath." To which Kirk responds "You look more like slob, keeper of no bath." Some funny disfigurement when beaming down in the transporter, where Kirk has a limb sticking out his ear, and an exterior view of the Enterprise in orbit, with Charlie Brown in the space background flying a kite. Here's a 1992 issue of MAD SPECIAL that collects almost all the same stories. I think they were reprinted a lot in the 1970's-1990's. Both covers by Drucker. I actually like the cover better on the one I don't have. 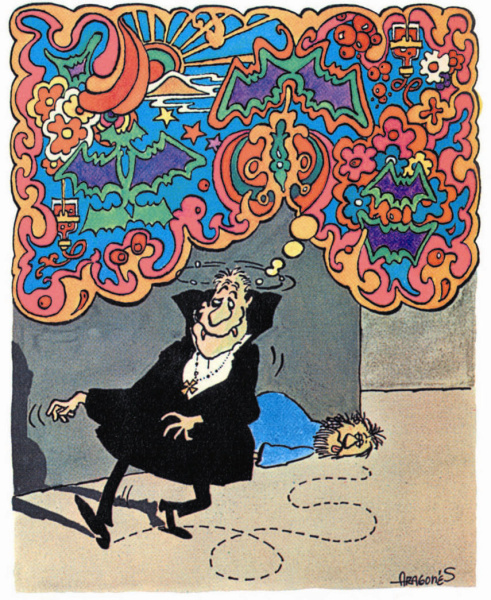 A hilarious Aragones offering I recall from a 70's issue of MAD. I think with GROO alone I have about 200 Aragones comics. I think Aragones began drawing for MAD in every issue since 1962. And beyond that, incredibly, he had time to do "Cain's Game Room" pages in HOUSE OF MYSTERY and other DC titles, as well as plotting and writing other DC stories such as the BAT LASH western series with Nick Cardy. And ultimately, PLOP. Aragones stopped working for DC in 1977 because of DC's then work-for-hire contract. Aragones is possibly the most prolific and successful cartoonist on the planet. His work for MAD alone would have made him world famous. And there's such a huge volume of work he's done beyond that!